(The call took longer than expected. I am sorry the man said it has to be this way !! Feel free to continue the story ? 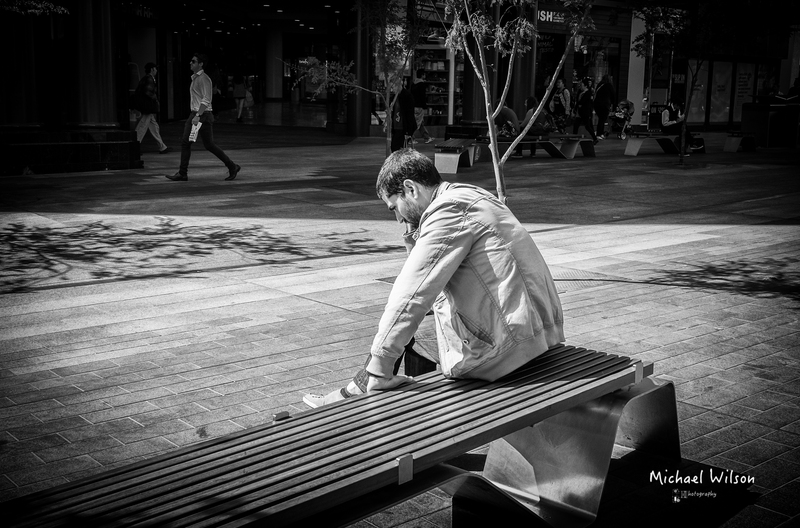 This entry was posted in Photography and tagged Adelaide, Adelaide Street Photography, black & white, City, Lightroom, Monochrome, People, Photography, Rundle mall, South Australia, Street Photography. Bookmark the permalink. wow one could go in a lot of directions in continuing that story. What a great shot! I’m guessing it probably isn’t good news unfortunately.. Someday I’d like to see someone just set a phone down and walk away. That would make an interesting story, I think. I have come to realize our lives are quite ordinary, however, and seldom are as complicated or interesting as we might imagine. Wow. Love this image. Personally I think it is one of your best. This one made my heart sad….”It has to be this way….” I ache for the person on the other end.